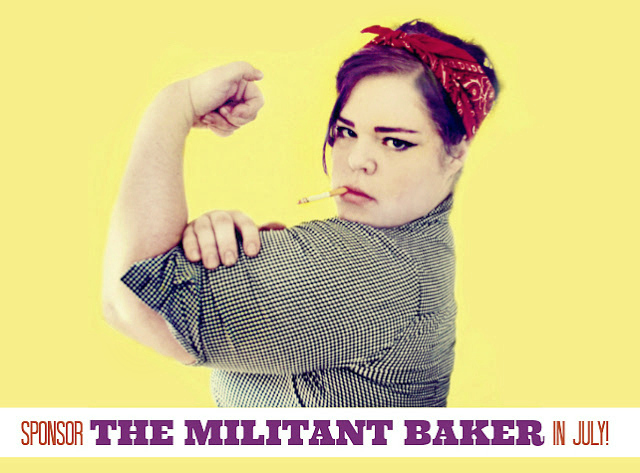 SPONSOR THE MILITANT BAKER IN JULY! I am living the advocate's dream, and I'm still trying to process how much wonderful has come my way! I'm also really weirded out that I just said "y'all". Unrelated: I miss the hell out of my purple hair... but definitely not the maintenance. Definitely. Not the maintenance. Because of my recent exposure, I have been offered more opportunities than I know what to do with. I've signed with a literary agent and am working on a book proposal. I've been asked to teach several workshops at a large national IT and Blogger conference in November (Cincinnati! Wanna go?). I have two college lecture agencies scouting for speaking opportunities. I'm teaming up with an anti-bullying clothing line. I'm working with revolutionary companies, writing for several large online platforms (recent xoJane article here! ), conspiring with body love sheros... the list goes on. The cool thing is you and I also have an opportunity to collaborate and you get to increase your online exposure while doing so. The Militant Baker is still having oodles of traffic (nearly a million monthly visits) and as I find more time to contribute the numbers will increase. I'm looking forward to expanding my blog in the next few months and have been making scheduling arrangements to dedicate more time to the site. Did I mention how lucky I am? You can purchase ad spots here; the large ones fill up fast so jump on over! I also have a "Partnered With" spot for companies that I love and support. If you're interested in chatting about joining forces in that way, drop me a line. Love you all more than I can say! Love your inkslinging!! Looking forward to hearing from ya!! Congrats! You hit the blogger big time - enjoy every minute of it.